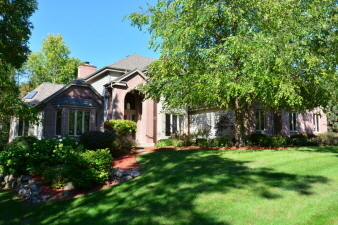 Beautiful home on gently sloping lot. The great floor plan makes for easy entertaining. You'll love the inlaid hardwood floors. This home also boasts new carpeting, new stainless steel appliances and a large master bedroom with two large walk-in closets. The heated three and a half car garage has basement access. Enjoy lounging on the beautiful new deck. All this and move-in ready! Schedule an appointment to see it today!